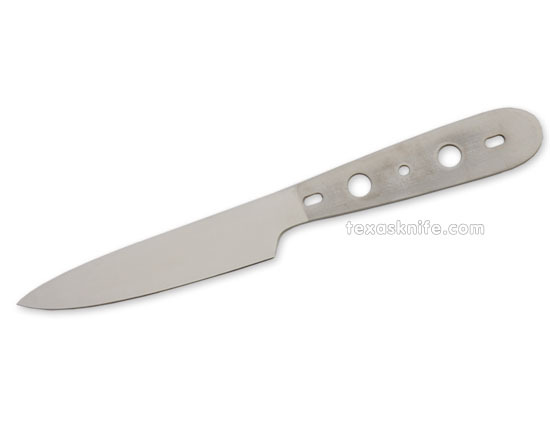 7-1/2" overall length, 7/8" wide, 3-1/2" long blade and 5/64" thick 440C stainless steel. Fine satin finish that easily polishes. CRYOGENICALLY TREATED to enhance its edge holding properties. The handle is punched with holes for three 1/8" pins and two 5/16" holes for bolts. These are fine blades and very useful. This blade along with the Cook's Favorite and the?Mid Size Chef make a nice set of three. ATS-34 Stainless Steel- 1/8" x 3" x 11-1/2"